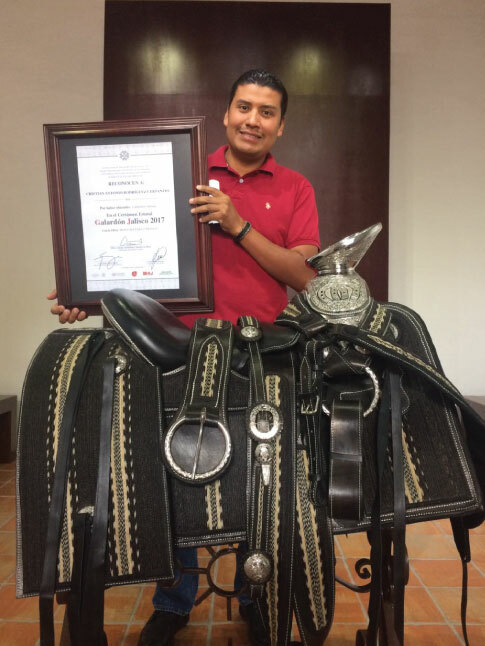 Last Tuesday, July 25, Cristian Rodriguez Cervantes won the Jalisco Award 2017 with his piece “Riding with the horse”, with which he obtained a recognition and was awarded with the grand prize which consisted of $ 20,000 pesos. This event was conducted by Instituto de la Artesanía Jalisciense and seeks to highlight and recognize the best of crafts in Jalisco. Cristian is an artisan with whom we collaborate in Fundación con Causa Azul; we met him in 2013, as part of the Cooperativa de Artesanos de Tlajomulco. He and his family have worked the horsehair from several generations ago, a craft technique that consists of twisting bristles in order to generate fabrics. Some points of sale where they have had greater incidence are livestock expos, charreadas, veterinary congresses, artisan exhibitions, among others. For the winning piece, 480 meters of braid were used, for which 10,400 twists were made with 886,660 sows; the preparation of the piece took approximately three and a half months between four people, only in the process of the mane, although it is also composed of saddlery and steel engraving. Currently the price of the saddle is of $60,000 pesos. For Cristian, this accomplishment is very significant: “we are filled with pride because it was not only me and my family …, behind there were many people who helped us; we are very satisfied and we also want to thank the people who support us and who are part of the team; therefore we are very happy. “, he told us. Cristian has his workshop in Cajititlán, and his contact Email contact is kraccris@hotmail.com. Join us as a volunteer and live the artisanal experience closely. Contact us and let’s talk, maybe there are more ways to collaborate with us than you think.